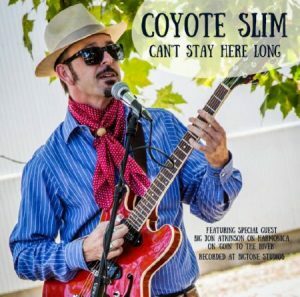 Coyote Slim is a singer/guitarist/songwriter, based in Sonoma County, Ca, and Can’t Stay Here Long is his sixth album and his first since 2013. 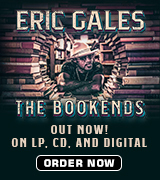 Backing himself on both acoustic and electric guitars, he describes his music as “California Delta Blues”, which isn’t a bad description at all. No mere copyist, Slim takes on various classic blues songs (as well as writing some himself) and re-imagines them to give each a fresh perspective. Opening with Lightnin’ Hopkins’ “Death Bells”, Slim’s deep and resonant voice recalls Son House or John Campbell while his finger-picked guitar angrily resonates with a heavily distorted electric guitar tone, in sharp contrast to Lightnin’’s more resigned and fatalistic acoustic version. Roosevelt’s Sykes’ early 1940s piano classic, “Trouble and Whiskey” is given an acoustic slide guitar treatment that slips in a few Robert Johnson licks. Likewise, Lonnie Johnson’s “Fallin’ Rain Blues”, replaces Johnson’s delicate flat-picking with Delta bottleneck, albeit played on an electric guitar. Other classics covered include Mercy Dee Walton’s “Lady Luck”, Robert Johnson’s “Stop Breakin’ Down” (here attributed to both Johnson and the first Sonny Boy Williamson) and Roy Brown’s “Lollipop Mama” (superbly redone as a solo electric boogie). Slim takes three songs (“Goin’ To Fresno”, “Pearvine Blues” and “Baby Please Don’t Go”), each now so old as to be in the public domain, and contributes additional lyrics of his own, as well providing imaginative backing. “Baby Please Don’t Go” in particular has been covered so many times that one might assume that the song could offer nothing new. Slim retains the essential melody, but plays the song on a mandolin, with its distinctive harmonic spectrum, which adds a lightness to the overall song. He also wrote three songs himself. “Russian River Blues” is an acoustic slide track, fraught with restraint. “Valley Fire Blues” also features acoustic slide guitar as Slim memorialises a Californian wildfire much as Charley Patton remembered the Great Mississippi Flood of 1927 in his classic “High Water Everywhere”. 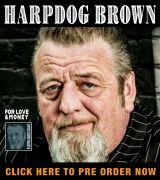 The final track, “Goin’ To The River” is the only song on the album with a second musician, Big Jon Atkinson adding subtle harmonica. Can’t Stay Here Long was recorded by Atkinson and Danny Michel and mixed and mastered by Atkinson at his Big Tone Studios. As usual, he does a superb job in capturing a live performance with modern clarity but vintage feel. Coyote Slim has released a very enjoyable and solid album of solo acoustic and electric blues. He is a fine guitar player and is blessed with a booming voice that is wholly authentic and that fits his music perfectly. Great stuff.